Welcome back to the El Charrito blog! You may be a little confused by the title of our blog . . . the time of New Year’s Resolutions has passed. It is the time of year when we have already stopped beating ourselves up about not staying true to our resolutions and have either given up all together or are trying to, once again, go towards our goals. Or, perhaps, with it being March, you are already thinking about that swimsuit and how you will look on the beach and how you can back into summer-bod shape. Wherever you’re at, we have good news! Mexican food is good for you! Read part one of this short blog series, keep reading to learn the details of this great news, or take our word for it and head down to our authentic Mexican restaurant in Monterey! “Beans, beans, the musical fruit, the more you eat, the more you . . .” If you don’t know the rest of this cliche little jingle then let us enlighten you; beans are one of the richest sources of soluble fiber, meaning that it helps to keep your digestive system moving and functioning at its best. Beans are also good for you because they keep you feeling full longer and can help lower your cholesterol. Beans also provide protein and iron, two nutritional building blocks that your body needs to repair itself and build. Find beans in almost all of El Charrito’s delicious dishes! Jalapenos and other hot chili peppers don’t just make you sweat and lunge for a cold beverage. They are also quite healthy for you, too! Capsaicin is responsible for the heat and also helps to lower your cholesterol, and speed up your metabolism — two things that most of us in Monterey want! We understand that not everyone can handle the heat, but don’t worry! At El Charrito, we offer a variety of dishes with varying degrees of heat. Pepitas are small little seeds that are jam-packed with nutritional benefits. Not only are they high in cancer-fighting antioxidants, they also provide iron, magnesium, manganese, phosphorus, and zinc. These little gems also provide you with nine grams of protein in every quarter cup! Who doesn’t love lime? Limes provide refreshment and that tangy flavor that makes our tacos — or whatever dish we are enjoying — that much more delicious. Limes aren’t just delicious, but they are also nutritious. Limes are full of vitamin C that has an antibacterial effect and can help our bodies fight free radicals. Put lime juice or oil in your drink of choice or squeeze a bit on to your tacos for a little tangy-zing. 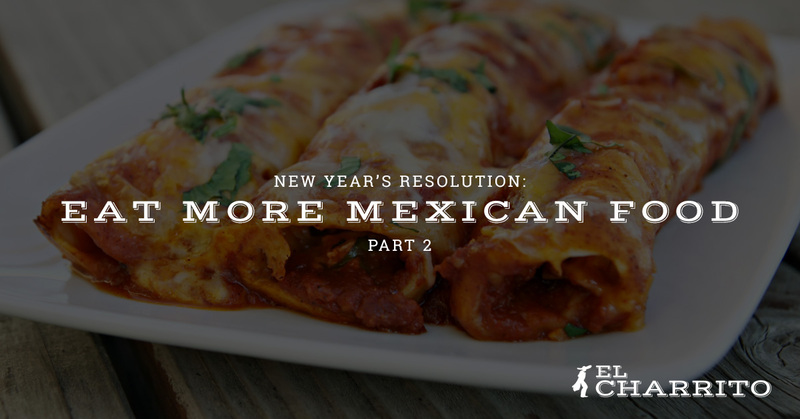 Basically, Mexican food has everything you need to stay healthy and happy! If you want to do something good for your tastebuds and your body, come down to El Charrito in Monterey! We just won the award for the best burrito in the Central Coast! Thank you Monterey County Now! Read what they had to say about our burritos and be sure to stop by our authentic Mexican restaurant in the Monterey area!